Welcome to the Digital Edition of the September/October 2016 issue. • Newsmaker – T-Mobile’s brand evokes some colorful adjectives: magenta, vulgar, competitive. But the brand not only enjoys those labels, it embraces them. In a few short years the once-distant fourth place mobile provider has become a contender, backed by a combative comms division headed by Janice Kapner and a CEO that rolls into a crowded room like a live grenade. 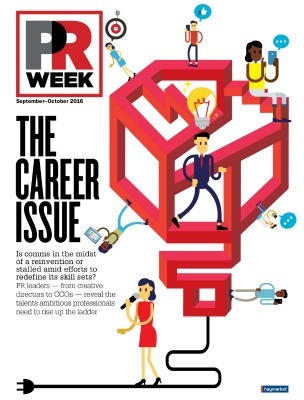 • The Career Issue – The feature highlights the changing dynamics faced by CCOs and agency execs across public relations – an industry in the midst of reinventing its own story. In addition, the world of integrated communications has forced agencies to refit their capabilities, shift budget money, and transform business practices to lure creative talent. And as agencies build out capabilities and refocus strategic value to clients they strive to make PR the most attractive option to generations native to social media. • Measurement roundtable: Necessary changes in behavior – Strong metrics should empower PR to impact consumer activity and business’ bottom line. As underscored by the industry leaders from Samsung, Aflac, IPR, BurrellesLuce, and Weber Shandwick, it all starts with communicators rethinking how and – perhaps more importantly – why they measure. • CEO Q&A – Sundial Brands ' Richelieu Dennis says he is dialing up comms and marketing a year after Bain Capital took a minority stake in the personal-care products company. • CMO Q&A – In a year, Europeans eat 40 pounds of yogurt. Americans eat 12. Peter McGuinness, Chobani’s chief marketing and brand officer, explains how the brand is making the product more enticing to Americans. • JQ&A – Media star Soledad O’Brien stepped out of the spotlight of national cable TV to work on content projects relating to social issues. PRWeek's Sean Czarnecki finds out about her new life.